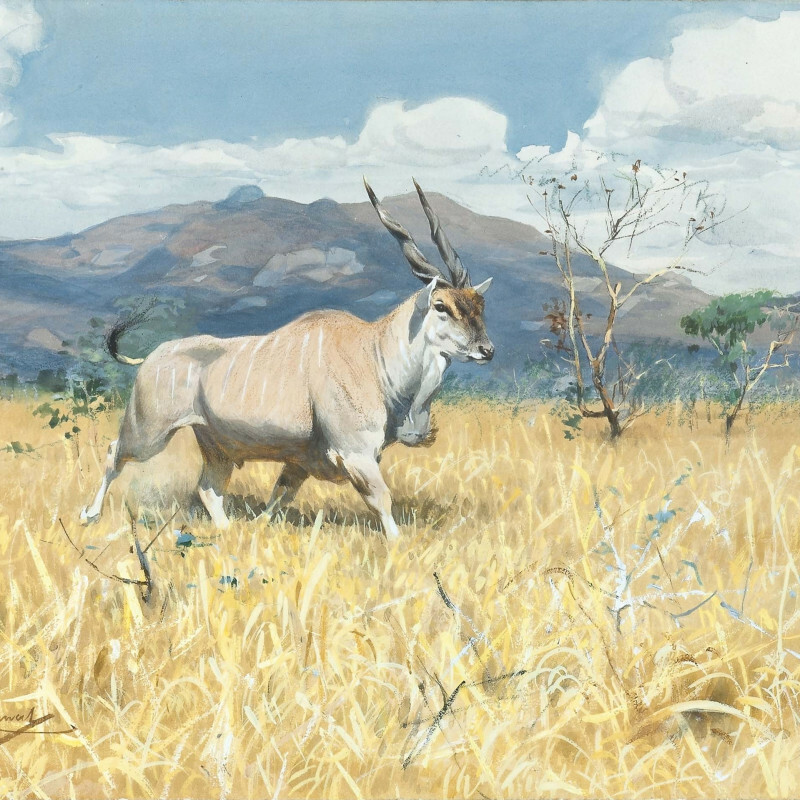 Friedrich Wilhelm Kuhnert began his career as apprentice to the Berlin painter and graphic artist Paul Meyerheim, who specialised in painting animals, and this provided him with a thorough grounding in closely observed zoological detail. When Kuhnert attended the Berlin University of the Arts between 1883 and 1887, the tutors noted his skill in rendering animal fur and anatomy and advised him to devote himself to animal painting. Kuhnert enthusiastically complied, and sought subject matter in extensive travels through Europe, Africa and Asia. there is no finer exponent of African mammals than Wilhelm Kuhnert. We who have traveled do not need to be told that his studies from nature are correct. His lions, elephants, zebras and antelopes are so real that we feel we are gazing at them on the plains of East Africa. The landscapes are simple but intense. Sunlight is there, and the tree and grass are just those that grow in the habitat of these species. Kuhnert has, as it were, got inside the very skin of African life, and draws you insensibly within the charmed circle. To the big game hunter − the man who loves to observe in preference to the man who only shoots − his views of wild life are complete because you know he has been through the mill himself, and studies with humility.